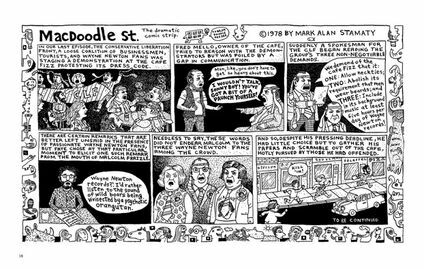 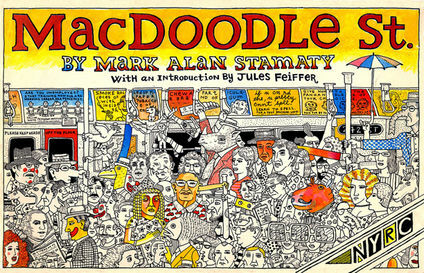 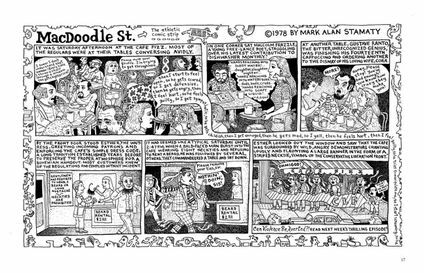 Every week, from 1978–1979, The Village Voice brought a new installment of Mark Alan Stamaty’s uproarious, endlessly inventive strip MacDoodle St. Centering more or less on Malcolm Frazzle, a blocked poet struggling to complete his latest lyric for Dishwasher Monthly, Stamaty’s creation encompassed a dizzying array of characters, stories, jokes, and digressions. 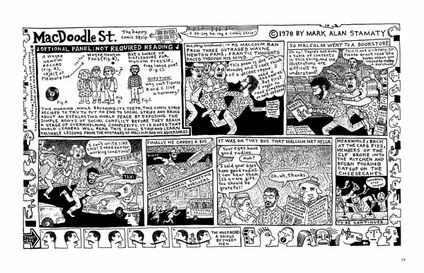 One week might feature the ongoing battle between irate businessmen and bearded beatniks for control of a Greenwich Village coffee shop, the next a dastardly plot involving genetically engineered monkeys, or the mysterious visions of a duffle-coated soothsayer on a bus, or even the variable moods and longings of the comic strip itself. . .